Catfish are known for being bottom crawlers and finding their food based on their exceptional sense of smell. Blues are known for their enjoyment of live bait and fresh cuts. They are similar in appearance to channel catfish but have a humped back and can grow to a much larger and considerable size. It&apos;s not uncommon for most anglers to catch 60-70 lb blues, especially in the northeastern part of Kansas where they&apos;re native to most of the rivers. Blue catfish in El Dorado Lake are of special interest because they are not native to that area. 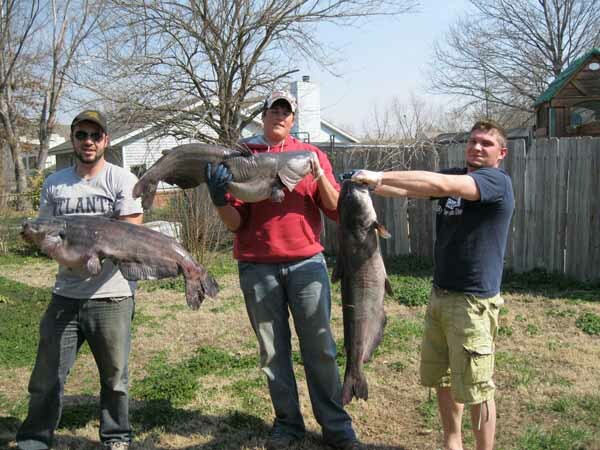 In 2005, the state of Kansas stocked El Dorado reservoir with over 600 tagged blue catfish. It&apos;s a specifically interesting case due to the ever-increasing population of zebra mussels. Zebra mussels are considered an aquatic nuisance in Kansas and blues are a natural predator that biologists hope will help control the population. While channel cats are found across the state, it&apos;s imperative to be able to correctly identify your catch because each has their own limits and regulations. Currently there is a 35 minimum inch limit on any blues caught in El Dorado reservoir and if a tagged blue is caught they encourage anglers to take note of the number on the tag, the size and the current location and contact the state wildlife department with the relevant information. For more information on the newest state record blue catfish, you can read the story HERE. Photos courtesy of Marc Cannon.